Soon, every patient in the Colonial Health Center will check in with an iPad. Updated: Sept. 24, 2015 at 2:31 p.m.
Students with appointments at the Colonial Health Center may no longer have to put pen to paper. University officials are in the process of transitioning to all-digital check-ins in the Colonial Health Center. 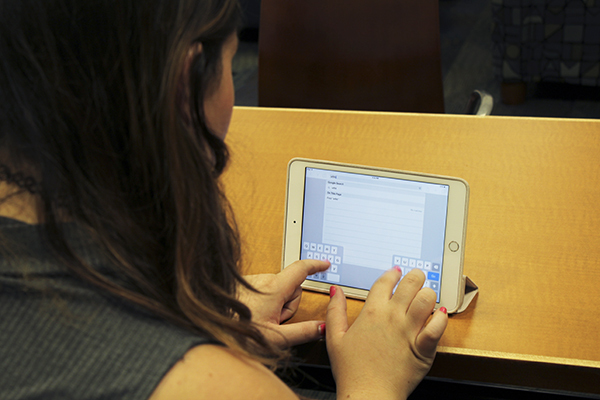 Last semester, students with counseling services appointments used iPads to check in, and those who checked into health services were given a clipboard. University spokesman Kurtis Hiatt said iPads are also available in the counseling office on the Mount Vernon Campus. Officials are transitioning to “a similar digital process” for the Medical Services office in the Colonial Health Center, he said. He said GW is working closely with student leaders to update students on their progress with the changes. “The University continues to transition to a fully digital check-in process for all students at the Colonial Health Center. We continue to work with our health information systems software partner to provide a similar digital process,” Hiatt said in an email. Hiatt declined to comment on how much the move to digital check-ins will cost. He also declined to comment on how the change will alter patients’ experiences in the Colonial Health Center. Student Association President Andie Dowd said over the summer that she and SA Executive Vice President Casey Syron asked officials, including Senior Associate Dean of Students Mark Levine, to increase confidentiality in the Colonial Health Center. “A number of students and student organizations reached out to us in the spring, the summer and now the fall to express their concerns over the differences of checking in at CHC,” Dowd said in an email. In an August interview, Dowd said she and Syron expected to see the check-in processes streamlined this month. The shift to iPads in the center is the latest checkmark on Student Association leaders’ goals for the year. Last spring, Dowd ran a campaign focused on student health and wellness. Over the summer, she and Syron successfully lobbied for resources like EMeRG and University Police Department phone numbers to be put on the back of new GWorld cards. Last spring, the Board of Trustees approved a 3.4 percent tuition increase, which officials said would boost mental health services on campus. The Hatchet incorrectly reported officials are transitioning to iPads in the Medical Services office. Officials are transitioning to a digital check-in process, but not necessarily with iPads.